Among the complaints we hear at David Groshen Salon, the most frequent issue is that people love their color, but are frustrated when their gray hair starts peeking through a week or 10 days after getting their hair colored. At the David Groshen Salon we know how busy you are, and that you can’t always find time to visit the salon for color on a weekly basis, so we made it our business to come up with a solution. It turns out two little jars and a Q-Tip can solve the problem of visible roots between colorings. David has formulated Hair Color to Go, offering clients an easy system for covering gray hair in their part area, all in the comfort of their own homes. During the consultation at the beginning of your coloring at David Groshen Salon, tell your stylist you’d like Hair Color to Go. We will mix a separate amount of your exact formula, this way you can leave with two jars mixed specifically for you: One of color, and one of peroxide. When you first notice the appearance of gray in your hair, mix the two ingredients in the containers together in the larger container, apply with a Q-Tip to the gray area, leave on for a half an hour, then proceed to shampoo your hair and your roots will be hidden. It’s a simple, safe innovation that leaves no mess. Now, when clients look in the mirror between appointments they’ll see fabulous color, without the distraction of unwanted grays. 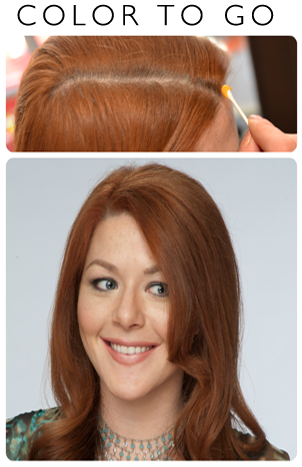 Ask about Hair Color to Go at the beginning of your coloring.